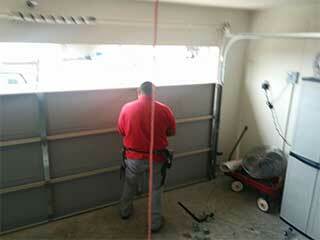 It's easy to take your garage door for granted until something goes wrong with it. One day you may arrive home after work only to discover that your door no longer opens, or that it does, but then gets stuck halfway up the track. Whatever the issue, our team can handle it. We can restore your garage door's operation and make sure that using it as a main entryway will be convenient, rather than frustrating. Replacing one or more torsion or extension spring of your garage door may seem simple, but this task carries the risk of serious injury. These components are under a great deal of tension, and must only be handled by trained professionals with the necessary experience and the right equipment. Our technicians are experts in this type of work, and can safely and effectively repair every issue your garage door may be plagued by. Whether it's a busted spring, broken cable or a damaged roller, we can quickly and effectively diagnose and repair whatever is stopping your garage door from working the way that it should. Many people store their vehicle in their garage in order to protect it from the elements as well as any would-be thieves. A severely bent or broken panel in your garage door could leave your vehicle, as well as your home, vulnerable to burglary. Our team can replace your panel, effectively restoring your home's security. Whether its repair, replacement or scheduled maintenance that you require, our team at Garage Door Repair Santa Monica can help you out. We also perform new door and opener installations, and our professional technicians will make sure any installation we perform is of the highest possible quality.